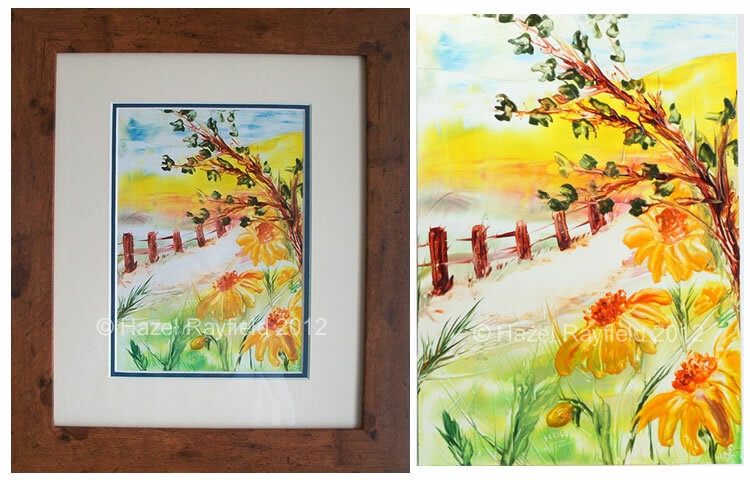 I recently had this painting, a landscape inspired by the beautiful surrounding in the “Garden of England” on a short break we had in Kent in September 2011, double mounted and framed. This pathway painting has been a favourite of both my husband and mine for some time, but we didn’t have a spot for it until recently when we redecorated our Hall, Landing and Stairway. The painting, an 8 x 6 Encaustic is transformed by the way it has been displayed. The double mount, a dark blue inner and a cream outer mount gives the picture an added depth and the frame, in a rustic wood style adds to the style of the subject matter in our opinion. Encaustic paintings like any other type of art, should not touch the glass if they are to be displayed in a glass fronted frame. As some encaustic paintings have a lot of texture it is important to ensure the mount is deep enough to allow for this. Most of my painting have texture but are not very proud. Some of the paintings in my shop here on Art In Wax and in my outlet stores are supplied mounted, other are not and come just backed, if I am not supplying a picture mounted ready to frame then we back them with 2mm backing board, this gives the painting structure as they do not want to be bent in any way as this may ruin the picture. Painting supplied with just a backing board can be mounted and framed or can be displayed on a display easel, this is another way I like to view my own Art and as you can see from many of the pictures on this website and blog I have an array of different size display easels for different size paintings. They are not very expensive and I personally like them as they can be moved easily and pictures can be changed without having to re-frame etc. I personally think Art, like beauty is in the eye of the beholder, we may all think of different things as Art, but what we each like, is what is important to us all, I think. Likewise how we display our Art, be it for collecting or Home Decor is a very personal choice, but seeing a piece of art displayed in a frame or on a display easel brings the art more to life …. would you agree?